We offer a variety of challenges found in obstacle course races (OCR). 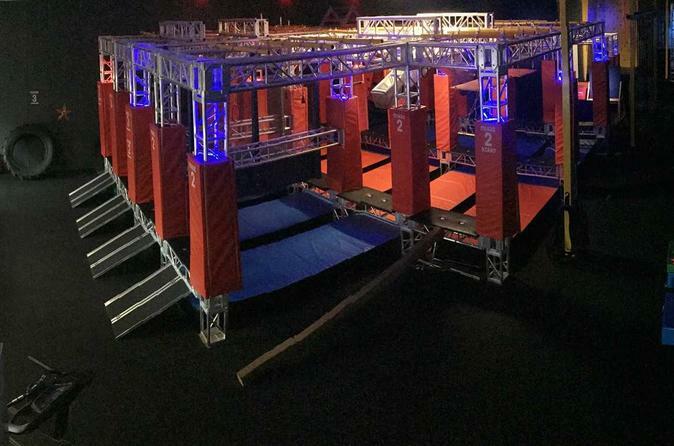 You'll be blown away with how much it feels like you are on the set of American Ninja Warrior or Spartan Ultimate Team Challenge! We haven't taken any short cuts in the building of these premium obstacles. UrbanWarrior uses the highest-grade aluminum trussing with custom-built safety pads. With over 38 obstacles, this is by far the most challenging and exciting course on the West Coast. You have access to the entire facility including bathrooms. A 60 inch TV with cable and Apple TV is included for the evening. A custom sound system for the facility is available for music as well. Sleeping bags and pillows provided upon request but you are encouraged to bring your own bedding. Two large bathrooms and a shower is available on site. We will personally coach you through the course to keep you safe and give you techniques for success and fun! Once we have coached you through the course you will have the entire facility to play in (a trainer is on site the entire time you are in the facility). People of all skill levels are sure to feel successful while having fun and getting fit! Our focus is to build confidence and self esteem, because no matter your athletic ability, you can achieve success.